We would like to extend a special thanks to all companies and organizations sponsoring this year’s Ogeechee International History Film Festival. If you are interested in partnering with us or sponsoring the film festival, please contact Rudy Bond at ogeecheefilmfestival@gmail.com. 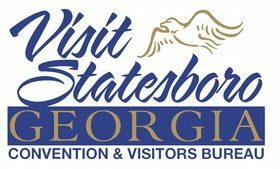 The Statesboro Convention & Visitors Bureau welcomes you to Statesboro, Georgia, a unique city where the Eagles soar. Its foundation is based on traditions that celebrate the southern lifestyle while embracing a new age energy derived from the local university and colleges. The Department of History offers Bachelors of Arts and Masters of Arts degrees in history and a graduate certificate in public history and specializes in Southern history, Georgia history, women’s history, and military history, among other areas. The Georgia Humanities Council promotes studies of history, literature, ethics, philosophy and religion by presenting stories and ideas that help individuals understand themselves and others. Shane’s Rib Shack is an American fast casual BBQ franchise, serving slow-cooked baby back ribs, hand-chopped chicken and pork, and Southern style side dishes. Nonna Picci is a from scratch pizza joint that specializes in wood fired food, including pizza, wings, pasta, calzones, and more. The Department of Political Science and International Studies offers Bachelors of Arts in Political Science and International Studies, a Bachelor of Science in International Trade, and a Master of Arts in Social Sciences. The Department of Communication Arts provides a forum through which students can develop life skills such as confidence in oral and written presentations, communication skills, and critical analysis and problem solving skills. The Department of Foreign Languages at Georgia Southern University offers courses in Arabic, Chinese, French, German, Japanese, Latin, Spanish and other foreign languages. The Georgia Southern University Film Club is open to all Georgia Southern students that have any interest in watching, studying, or creating films. Film Club GSU raises awareness of film and television related events, projects, and opportunities for our community. Join the History Club to meet other history lovers and “travel through time” to explore the different areas of history.